The first 2018 Glammy Finalist featured in our series is Zoe Roman from South Side High School! 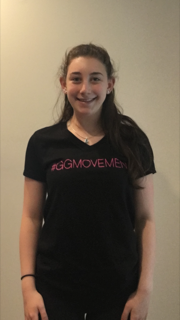 She is the president of her chapter and was first introduced to GlamourGals by her older sister, Carly. Read more about her long relationship with GlamourGals and how she incorporated modern technology to her interactions with seniors! Why is GlamourGals important to you and your community? GlamourGals is important to all generations in my community. It provides an opportunity for companionship, communication, and bonding between high school girls and older adults and a way for them to get insight into what life is like for the other. At a time when many senior citizens are feeling lonely, it provides a loving presence. At a time when young girls are feeling socially anxious, it provides a source of confidence and compassion. There are many clubs and activities in my school and many opportunities for community service, but most center around fundraising. GlamourGals is the club that has the most immediate and direct impact on its participants. My chapter visits the residents of Maple Pointe Assisted Living and when we walk in the room, the air literally lightens. The sound of chatter and laughter is more beautiful than any song. I know that it makes the residents of Maple Pointe feel happy when they see us and I am personally enriched by the feeling of joy that I get each time I am there. How have your experiences as a GlamourGals volunteer shaped your aspirations and future career goals? I first became aware of GlamourGals through my older sister, Carly. I would tag along when she would visit some of the friends she made at Maple Pointe Assisted Living, and I would watch her interact with people so much older that I couldn't understand her connection to them at first. Over time, I began to notice how the residents, many of whom didn't have family or friends nearby, lit up when Carly and I visited. One resident, Ruth, made a point of asking me about my dancing and schoolwork, and she remembered everything I told her so she could ask about it at each visit. I began to wonder what Ruth's life was like in between our visits and I learned that her family wasn't able to visit her often and she spent most of her time in a chair, in front of the TV, alone. This gave me the idea to ask Ruth if she wanted to learn how to use an iPad and how to access certain apps that could help her pass her time. Eventually, Ruth got her own iPad and we spent hours navigating it together, which gave Ruth so much pleasure. Again, I was inspired to pursue an education and possibly a career in computer technology geared toward solutions for healthy and happy aging. This fall I will be attending the University of Pennsylvania as a Science, Technology and Society major, and I will be working for solutions for Ruth and other senior citizens.